My mother, Roberta Marie (Royce) Smith, was born in 1943 in Sacramento, California, to Eunice Marguerite Royce and Thomas C. Royce. 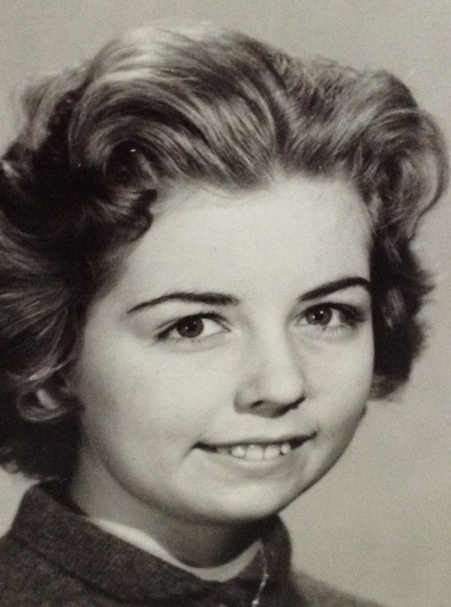 One of two children, she lived with her younger brother and their parents in the same, tidy 3-bed/1-very-pink-bath house on 40th Street in East Sac until she moved out in 1961 to go to college at the nearby University of California at Davis (UCD), just 30 minutes away. There, she studied math, eventually got her teaching credential and made lifelong friends. I’ve met these friends. I know them well. I grew up with some of their kids. Part of the group went to UCD’s Picnic Day every year together, practically every year of my childhood, until I, myself, moved away from Sacramento, to go on to college and into adulthood. And I’d never heard this story until now. Going up in flames? I have no idea what she’s talking about. So she explains, marveling first at how, collectively, she and her three college roommates spent $20 a week on food – each contributed $5 apiece. To last an entire week. I’m fairly confident five bucks could not cover a single Happy Meal or “handcrafted” latte in 2012. “We could eat all week on that!” I can see her excitement growing at the possibility of making sandwich rolls right then, in her own grownup kitchen, the one of my childhood. And as she describes how they’re made, I’m suddenly eager to take on the sandwich-roll mantle. If you imagine a cheeseburger and meatloaf and common condiments and dinner roll all mushed into one handheld snack, you come close to understanding the sandwich roll. Essentially, you stuff a mixture of ground beef, cheese, onions, olives and spices into a hollowed-out, doughy roll, wrap the whole thing in wax paper and shove it into the oven to heat through. Sounds like ideal late-night food and something a child could manage, if not for the fire hazard aspect of the process. It’s also cheap – instantly making sense of the sufficiency of the girls’ weekly budget. (The recipe my mom dug up for me yields an impressive 16 rolls.) And she and her friends apparently ate these things all the time, nearly fifty years ago. I love learning this about her, the woman of perfectly square meals for her children – always a green vegetable! ; a third-grade teacher of 30-plus-years-now-retired; and a person of humbleness, goodness and dependability. Her earlytwentysomething go-to snack was basically a mini hamburger. When I think of my mom, I think first of her smile. A giant, warm, toothy grin has been her permanent accessory since childhood – and is one I’ve inherited. It’s also a great indicator of the kind of person she is: kind, a good laugher, thoughtful and giving. Helpful. Genuine. She volunteers at the church she (and subsequently I, and my sister) grew up in – First United Methodist – helping to prepare meals for large groups, including for memorial services and the local homeless. She especially likes comfort foods, barbecued (Sacramentospeak for “grilled”) steaks and interesting breads. She cries easily at emotional stories – whether on the news, in conversation or even just a touching commercial – but is always quick to laugh through the tears. She is entertained by my father, driven mad in everyday ways by my father, and absolutely adores my father. They’ve been married for more than 40 years. She played Fur Elise on the piano pretty regularly when I was young, and probably still could if she wanted to. She drove us to dance classes nearly everyday when we were teenagers. She is loving and personable, and much like her own mother in the way people are instantly and easily fond of her. And she has always been a natural, wonderful home cook. Mom’s sandwich-roll foray into young adulthood cookery turns out to be a natural extension of her earlier childhood favorites: lots of meats and hearty, homey dishes, with kidney bean casserole topping the list. “We ate that a lot.” Grandma apparently loved liver and onions, but after trying to serve it once to Grandpa – who we nicknamed the Garbage Disposal, since Grandpa will eat anything – it never appeared again on the family dinner table. “Oh, he hated it!” my mom told me. Everyone’s allowed one thing, I guess. 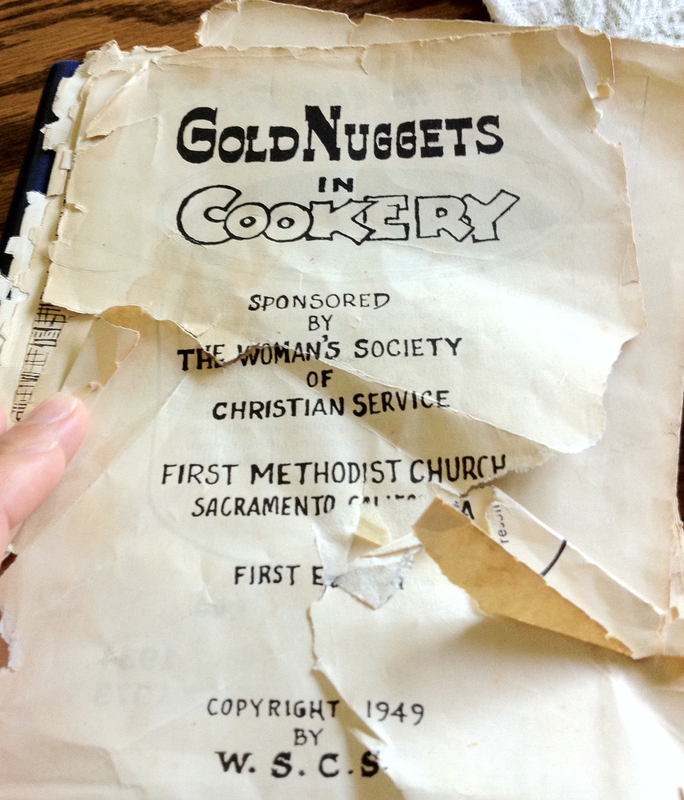 As we’re talking about these old favorites, she pulls out heirloom family cookbooks, including a classic church production from 1949 entitled “Gold Nuggets in Cookery” – sponsored by the Women’s Society of Christian Service. (While plastic comb-bound, the little booklet was quite official; the ladies even filled ad space to supplement the costs of production.) Carefully leafing through its pages, with their curled, brown edges, she shows me the recipes of her childhood, reminiscing all the while about what her own mother liked, didn’t like, changed, and then which dishes she adopted herself as she ventured off on her own. The “gold nuggets” include things like “Cherry Pudding,” “Heavenly Food Torte” (made “heavenly” by chopped dates and “broken walnut meats”), “Cracker Enchilada” and Mom’s beloved sandwich rolls – here, called “Stuffed Rolls.” Recipes are often adorned with sweet little illustrations that my mother proudly colored in herself as a child. In a separate scrapbook, we find handwritten recipes interspersed with magazine clippings, including a short recipe for “Creamy Mocha Frosting” with a subhead that reads “No Cooking – Spreads Like a Dream – Stays Smooth” from what was obviously a Nucoa margarine ad. Another recipe, in my grandmother’s own careful script, is for “Sugar Saving Devil’s Food (Mother)” – apparently a gem of my great-grandmother’s for providing a proper dessert during the war years, deriving its sweetness from a little bit of sugar (just a quarter cup) and a lot of corn syrup (a full cup, either light or dark). Seeing my grandmother’s handwriting that reads “Good” on certain recipes and “Not Good” (actually underlined) on others, and watching my mother’s eyes light up at the memories she’s recounting inspires me. I feel connected to a tradition of comfort food cooking and my own love of protein-and-carb-rich meals, pastries and recipe-sharing illuminated in a new way. And now I want to make sandwich rolls followed by a lovely one-egg cake for myself and my husband tonight. With the exception of the rolls themselves, combine all ingredients in a medium-sized bowl. Split each roll nearly in half but do not cut all the way through, remove a little bread and fill rolls with meat mixture. Wrap each filled roll in heavy wax paper; twist ends tightly together. Place wrapped rolls in the preheated oven for 10-15 minutes or until warm. Makes enough for 16 rolls. Preheat oven to 350 degrees (moderate). Grease well and dust with flour a square pan, 9x9x1¾ inches. Sift dry ingredients into a bowl. Add shortening, vanilla and 2/3 of the milk. Beat for 2 minutes, medium speed on a mixer, or 300 vigorous strokes by hand. Scrape sides and bottom of bowl constantly. Add rest of milk and egg. Beat 2 more minutes, scraping bowl constantly. Pour into prepared pan. Bake 30-35 minutes. Finish with your favorite icing or one of the toppings below. NOTE: Cake may be baked in 2 round layer pans, 8×1½ inches, for 25-30 minutes at 350 degrees. Orange Glaze… Mix ¼ cup orange juice, ½ teaspoon grated orange rind, 1 cup sifted confectioners’ sugar. Let stand on top of oven while baking cake, stirring occasionally. Leave cake in pan. With fork, prick holes through cake to bottom. Pour warm glaze over the top. Broiled Topping [Mom’s favorite]… Mix 3 tablespoons butter or other shortening, melted or softened, 1/3 cup brown sugar (packed), 2 tablespoons cream or top milk, ½ cup Wheaties or coconut, if desired, and ¼ cup chopped nuts. Spread on baked cake. Place about 3 inches under broiler (low heat) until mixture bubbles and browns (3 to 5 minutes). Do not burn. Hi Laura! How fun to read your blog. I have lots of memories of “home cooking” and would love to contribute to your collection of stories. Contact me if you are interested. Hi, Jennifer! Thanks so much – and of course I’m interested. Let’s schedule time to chat – I’ll follow up. Can’t wait to hear your stories. LESB! I love this story about your mom’s sandwich rolls. This is such a great project and I also just love reading stories you have written. I miss you and the Smith Family! Andrea, you are so great. Thanks for your support. The entire Smith family misses you too! Laura, what a wonderful tribute to your mother. I can vouch for all the nice things you said about your mom, as I have counted her my friend since 8th grade at Kit Carson Jr. High! Even as a junior higher and high schooler she hosted pizza (homemade) parties (I helped) as well as sewed clothes for children for whom she babysat. We volunteered at the Next-to-New Shop (Sutter’s Thrift Store) as high schoolers on Saturdays and I helped your mom babysit at the church nursery, too. I moved from Sac the middle of my junior year in high school, but stayed in touch and roomed with her in the dorm at UCD our freshman year and again as seniors in the University Ave. apt . Reading your blog brought tears to my eyes; all you said was so well written and true. I was just thinking of your mom’s generosity with her talents the other day. 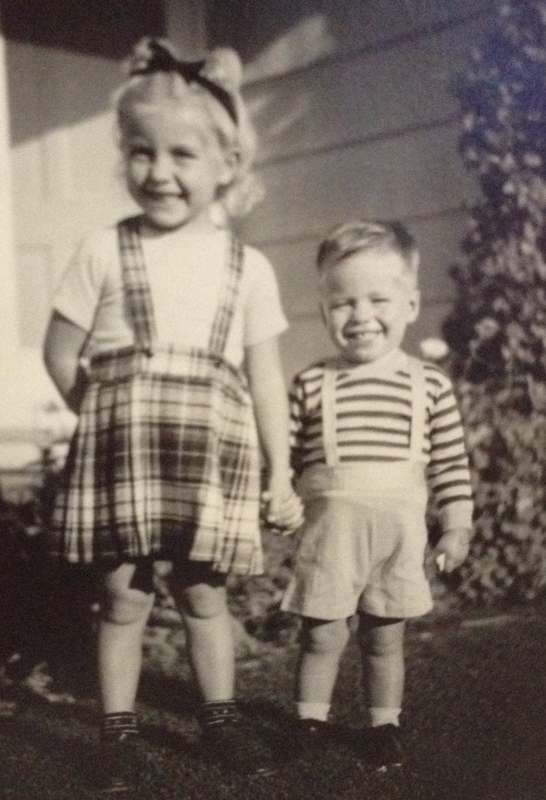 She made little twin red plaid outfits for my two daughters, who were about 4 and 1 1/2 at the time when we lived in Visalia. I returned them to her when she had you and Emily. Do you remember them? I have another activity I could add that your mom and I did in our early teen years, but you can ask her about the little league ball games we used to attend following a certain boy. See if she remembers. I loved your blog. You absolutely nailed your mother and my friend, Berta Marie! I’m going to make the sandwich rolls very soon! Thank you for the recipes. Darling girl, you are a joy and an inspiration. I am thinking of your mama’s delicious Christmas cookies (scarfed down in the company of a billion festive Nutcrackers), big dishes of M&Ms, and little brown crockery cups with fruit cocktail. What a wonderful tribute to your mom. The internet is an amazing place. Tonight I decided to try and search for a Sacramento High School friend, Joann Van Alfen. I couldn’t find her and decided to search for your mom, as she was a friend of Joann’s and mine too. I was amazed to find such a personal site that took me back to that time. Thank you, Lani, for your kind words. So glad you were able to connect with my mom in this way.